Home Celia J Anderson FestivalsWorkshopsRetreats Writers writing Workshops: so what makes them work? I love the whole idea of a workshop. The name conjures up an intensive but fun session with like-minded writers who hopefully don’t take themselves too seriously. It’s also an ideal opportunity to break out your notebook collection to impress people. But what’s the secret of a successful workshop? And why take part at all? Over the years, I’ve explored a wide variety of workshops with varying results. Sometimes they’re disguised as festivals with guest speakers who not only are excitingly famous but when you get in there, you find to your delight that they’re quite prepared to share the tricks of their trade. And they are willing to let you have a go at the writing process and hold your hand while you do it. There might even be biscuits. And wine later. These ones are excellent. One of the first of this type of event that I made myself attend as a terrified aspiring writer was one of the well-organised Writers’ Workshop Festivals in York, back in 2010. Harry Bingham and Kate Nash were largely responsible for the organisation there, and I threw myself into the whole thing with gusto, coming away with a few good contacts, several new friends and having been part of the Authonomy event. This involved sending a couple of chapters in beforehand, which, if selected, you were expected to read aloud to a huge room of very well-oiled people who were full of dinner and wine. This was scary but at the end, Kate Fforde, romantic novelist extrordinaire and all round good egg, came up to me and said ‘I know you didn’t win but I just wanted to tell you that my table liked your story the best.’ She may have been going round to everyone saying that for all I know, but I almost wept. It made the whole weekend worthwhile and stopped me being quite so in awe of the already successful delegates. 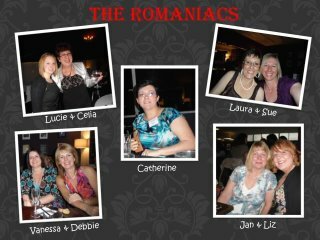 Heartened by this experience, I signed up for the Festival of Romance 2011 in Watford (now in Bedford: another of Kate Nash’s creations) and met a wonderful group of people. Nine of us later formed ourselves into The Romaniacs, an online writing group, I hope these ladies will always be my writing support network, drinking buddies and fabulous friends. A network SCBWI event followed in Birmingham, when we workshopped chapters of our children’s novels, critiqued each others’ work and received excellent (tactful but honest) feedback. In between times, I run my own workshops for children, using dressing up clothes and various other props to stimulate lively imaginations and to generate great writing. At the moment, I am running one to write the Year Six play at the school where I teach. Spending a whole day focused on nothing but writing and what leads up to it, with lots of fun activities included and plenty of breaks for a bit of gentle exercise, seems to work well whatever your age group may be. There are lots of places that you can go to experience the workshop buzz. You don’t even need to leave the comfort of your sofa – the recent bulletin from SCBWI detailed several online discussions on Twitter that would work in almost the same way, one every Wednesday evening at #yalitchat and one on Tuesday evenings at #kidlitchat. Moderators pose topics and agents/editors visit to chat too. Why not start your own online Twitter workshop session? You even get to choose the nibbles. In the same bulletin, author Kim Tomsic from the other side of the pond describes her ‘schmoozes’ which are informal local get-togethers where workshop type subjects are generated and planed together. Another good one to experiment with nearer home, maybe? SCBWI have some fantastic regional events for those of us who don’t get to the big city very often. My nearest group, based in Birmingham, has some great activities with Clare Bell sharing her expertise in a variety of ways, including the wonderfully named Critique-nique. Try browsing in the ‘What’s on’ section of the SCBWI site – you’ll be spoilt for choice. The Picture Book Retreat in July (5th-8th) also sounds like one to look out for. Guardian Masterclasses are often run on workshop lines too, with some charismatic leaders, covering subjects such as ‘How to complete a first draft’ for absolute beginners but also offering a range of others for the ones of you who have less basic concerns. So, in a nutshell, the choice is yours – stay at home networking workshops and local do-it-yourself groups right through to the whole-weekend-hangover-included-free variety. Can you add to this list with your own workshop experiences? Perhaps you went to The WInchester Writers' Conference or SCBWI British Isles' Conference also in WInchester, in November? When she’s not marking children’s work, or writing stories involving pants, Celia spends far too much time on Facebook (Celia Joy Anderson) and does a lot of walking to counteract the cooking, eating and drinking which form another of her hobbies. She blogs as part of the Romaniacs online writers’ group . You can also find her over at her own website. Celia’s first novel, Sweet Proposal, a contemporary romance involving chocolate, a jacuzzi and a bespoke bookshop, will be published by Piatkus Entice on August 1st. Her ultimate dream is to have her children’s books published too. Usually sea-starved in the depths of the Midlands, she can often be found wandering happily around Brighton visiting her two daughters pretending to collect ideas for her next book. Not exactly a workshop but I did dash up to the free events at Winchester last weekend. I can't resist an open mic. I'm cursed with no nerves beforehand but a crushing embarrassment after. Anyway what's useful about an open mic is gauging audience reaction it's fairly easy to distinguish between polite applause, wanting to hear more and sleep! It's the beginnings of workshopping for me -finding out if I'm more or less on the right track. Soory I didn't reply before Jan - head down in school books, but thanks for commenting. I love workshops. I've attended several workshops - including a Guardian masterclass with Jay Rayner. I also run them in all my teaching weeks for students on our creative writing programmes at Salford. One thing I think is sure: you get more out of them if you are prepared to put something in and this often includes stepping a little way out of your comfort zone. However, the facilitator should be ready to support you. Hi Gill - I'd love to go to a Jay Raynor workshop - what sort of things did he cover?